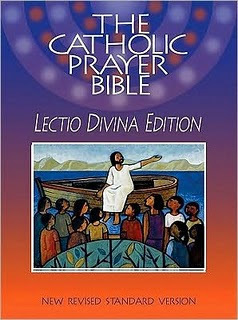 Paulist Press will be publishing The Catholic Prayer Bible: Lectio Divina Edition in April. Coming in both hardcover and paperback editions, this is "an ideal Bible for anyone who desires to reflect on the individual stories and chapters of just one, or even all, of the biblical books, while being led to prayer though meditation on that biblical passage." The translation used is the NRSV-Catholic Edition. Paulist Press is currently taking pre-orders, if you are interested. Shipping date is said to be on April 26th. One thing that excites me about this edition is that it uses the fairly rare, at least in Catholic Bible circles, single-column page format. I think I can count the number of single-column Catholic Bibles on one hand, most notably the NJB and Little Rock's The Four Gospels. Of course, I am interested to see how useful this Bible will actually be in promoting Lectio Divina. I also wonder what else is included in this Bible? Concordance? Maps? Perhaps if this becomes popular they will consider publishing it in italian duo-tone or premium ultrasoft editions. More info on this once its released or whenever I get some additional information. What an awful cover. I hope this is a decent Bible. Recently I was in Borders checking out the Catholic Faith and Family Bible and noticed some heretical things in the notes. For some reason dissenters and liberals are drawn to the NRSV, which is a shame because its really not as "left" as its made out to be. Thanks for staying on top of the new releases for us. One of the reasons, I think, is that the NRSV is a lot easier to get permission to use. Like you said, it's not really a Bible of the left, but of course some people will argue that its use of inclusive language suggests that it is. Of course, they fail to realize that the NRSV footnotes, which show when inclusive language is used, is considered an integral part of the NRSV text. That sounds like it wouldn't fit in an single volume. Does anyone publish an all-in bible like that (for any version)? It looks painfully didactic with its suggested with its pre-digested read/reflect/prayer/act instructions for each section of the Bible. I would argue this is not Lectio Divina but rather makes a farce of serious meditation. How does one meditate on Scripture when there is a sidebox telling one exactly what one should think? How does one create inner prayer when there is a sidebox telling one exactly what one should pray? I would think that almost any Bible sans commentary would be better for Lectio Divina; alternatively, a Bible with patristic commentary (there are many, many examples, but here is one that was explicitly marketed as a Bible edition useful in Lectio Divina. So I don't really understand the market for this edition, except, perhaps, people who wish to act as if they are performing Lectio Divina without really doing the hard work of Lectio Divina. the NRSV is a lot easier to get permission to use. I didn't know that. Thats interesting. some people will argue that its use of inclusive language suggests that it is. Right. But a lot of modern Bibles, including the popular evangelical ESV use a moderate amount of horizontal inclusive language. The only update of the RSV without it is the RSV-2CE, which frankly could be considered as almost a complete update itself. Even the new NIV-2011 will have inclusive language. Yeah, my reference Bible pipe dream is not in print. But I would say it could get done in a fairly slender one-volume, if the CCC references were similarly formated like the Biblical cross references. I am not suggesting they reprint the CCC notations in the text itself, just the references. Perhaps they could include numerous intext boxes that highlite some important connections, with actual quotes from the CCC. I might need to take a look at that NJB version you linked. As for the search for that perfect Bible, what do you think of the "New Catholic Answers Bible" from Fireside Publications? It includes 80+ note sections on important topics which are cross referenced to the CCC and has an RCIA program keyed to it. NAB text. What do you think? Another reason the NRSV is considered a "Liberal" or "Progressive" translation is because it is officially advertised as such. Check the list of endorsements on the official website which this blog links. In the top five endorsements there is a post-modernist Quaker, a famous Presbyterian who quit Church to isolate himself in Vermont, a former Episcopal priest who quit Cher ordination and her church, now hiding on her farm because Christians "need to put their Bibles down", and a Marcionite who rejects the Divinity of Jesus and declares that most of the Gospel never happened. With top-tier Endorsements like this, it seems reasonable to conclude the owners of the NRSV wish to promote its position as the dissenter's translation. I like the 'New Catholic Answer' Bible. I think, as you say, that it should be the Bible given out in RCIA classes. I only have two problems with it: 1) still waiting on the revised NAB OT and Psalms 2) I am not a big fab of bible inserts. I would much rather see them integrate the apologetics stuff into the text, rather that insert glossy paper inserts. But that's just me. As for the NRSV, i see your point. I know of a number of solid scholars, NT Wright and Michael Gorman, who use it in their works. So, I think one thing that the NRSV people could do would be to add some more recommedations from more 'conservative' scholars. Either way, I am very comfortable when using the NRSV, knowing where it's strengths and weaknesses. The NRSV is used in Liturgy of the Catholic Church in Canada (with some tweeking) and is rumored to be the future translation for the Catholic Churches in the U.K. So for Catholics it is here to stay. As for this Lectio Divina Bible, I will wait and see, I'll check it out at my Paulist Press bookstore when it is released. Thanks to your response I've been reading up on NT Wright's statements concerning the NRSV. Can you point to any other well known orthodox theologians who prefer the NRSV? Any orthodox Catholic theologians who prefer the NRSV? I would greatly appreciate a list, however long or short. Quote: "I like the 'New Catholic Answer' Bible. I think, as you say, that it should be the Bible given out in RCIA classes. I only have two problems with it: 1) still waiting on the revised NAB OT and Psalms 2) I am not a big fab of bible inserts. I would much rather see them integrate the apologetics stuff into the text, rather that insert glossy paper inserts. But that's just me. Tim, I know that you are a big NT Wright fan. But NT Wright and Michael Gorman are both "Protestant" biblical scholars. They are NOT Roman Catholic!. If you truly embrace the Catholic faith than you should start praising Roman Catholic scholars vs Protestant ones. I know it's tempting, but technically Protestants are heretics. And their understanding is flawed. If they truly understood scripture and tradition than they wouldn't be Protestant in the first place. They may have all the credentials in the world, but they are still Protestant and therefore preach heresy. Ask NT Wright if he considers the Deutercanonical Books as inspired by God with EQUAL status as the rest of the Old Testament. You will find that he doesn't. I would read the Early Church fathers, like Chyrysostom, or Athanasious, and get their interpretation of Holy Scripture and follow their understanding vs NT Wright (CoE) or Michael Gorman (Methodist). That Catholic Prayer Bible looks way to post Vatican 2 ish for me. Like a Good News Bible. As for calendars, it does no good if you follow the Extra-Ordinary Form calendar of readings. I would take an Orthodox Study Bible or Haydock Study Bible over that one any day. I've never heard Mass under the Extra-Ordinary Form. What version is are the scripture readings from? technically, people who were born into any number of the Protestant ecclesial communities are not heretics. One could say that about those who originally broke away, but not current Protestants. See Lumen Gentium or Unitatis Redintegratio for more on that. As for the NRSV, there were actual Catholics on the translation team. Now they may not be your style of Catholics, but they are nevertheless. There has also been Catholic contributions to all the major NRSV study bibles that are on the market . I have never said the NRSV is perfect, but it is approved by the Bishops for private use and used it enough on my own and in graduate theology classes to know it's strengths and weaknesses? Going by your logic, how could you recommend the Orthodox study bible? It's NT is the 'protestant' NKJV and it is not approved by any Catholic bishop's conference. In the Extra-Ordinary Form the Douay Rheims is usually used for the readings when they are read in English after the Latin. Quote: "Going by your logic, how could you recommend the Orthodox study bible? It's NT is the 'protestant' NKJV and it is not approved by any Catholic bishop's conference." The notes are Orthodox, not Protestant. And the Old Testament has been retranslated to be in continuity with the Septuagint. The OSB also includes the Deutercanonicals in there proper order. Also if the Protestants were not born Protestant as you say, than why are they not Catholic or Orthodox. What is a Protestant then?. According to Lumen Gentium our seperated brothers and sisters are joined to the Catholic church, although imperfectly:"the Church knows that she is joined in many ways to the baptized who are honored by the name of Christ, but who do not however profess the Catholic faith in its entirety or have not preserved unity or communion under the successor of Peter" (Lumen gentium, 15). There is no indication in Vatican II or any document by a Pope in the last fifty years which refers to current Protestants, who were brought up Protestant, a heretics. Well the Church wasn't created 50 years ago. We can reference documents from any age, especially councils, which pronounced anathemas. Tim you mentioned our separated brethren are joined to the Church but imperfectly. Thats true but so were the Arians, Monophysites, and Albigensians. People brought up learning heretical things (like me, a convert) and end up believing them are called "material heretics". They may not yet be guilty of formal heresy but nonetheless are heretics in some fashion...however unfashionable it may be to name them such. @Becket: I have the Orthodox Study Bible NT and in the notes there is a clearly anti-Catholic tone. I'm not so sure the OSB is a good one to use for us Catholics except for reference. "That Catholic Prayer Bible looks way to post Vatican 2 ish for me. Like a Good News Bible." Don't judge a book by its cover! :-) Let's wait and see. Agreed!. Let's wait and see. I see. Then really the only Bible that you'd be interested in to have scripture readings would be a Douay or (at most) a Knox or Confraternity, right? I have to say that I'm closer to Timothy on the larger issue being discussed. People (Protestant, Catholic, and anything else) are right when the agree with the Church, correct? From the little I've heard about NT Wright he agrees with the Church more often that most scholars. Francesco, I also enjoy the RSV CE. As for NT Wright, he should convert to Catholicism if he agrees with the teachings of the Church . Put his faith over his pension and status. Maybe NT Wright could give the Anglican Ordinariate a thought. We live in bizarre times, where Roman Catholics are prone to be unfaithful dissenters while cradle Episcopalians just might hold every tennant of the CCC which has been rejected and mocked by the local Roman clergy. In this context, conversion to Rome is not a clear cut decision for Wright or anyone else. As for me, thanks again, Timothy, for pointing out Tom Wright's NRSV connections. That has been helpful to me. If a man of Wright's calibre can like the NRSV then surely I can learn to respect it. Therefore, I repeat my question - are there any other orthodox scholars - Protestant or especially Catholic - who like the NRSV? My flesh is willing to give the NRSV a shot but my spirit is shouting, "Danger!" More orthodox endorsements would help. As usual, I'm wondering about the size of the font......hoping it is large enough for my poor eyes. I will take a look around to try and give you some more names. Off the top of my head, I do know that the Catechism of the Catholic Church utilizes the NRSV along with the RSV. Also, the new Catholic Commentary on Sacred Scripture published by Baker, although using the NAB as the base text, does make constant reference to other major translations, most notably the NRSV and RSV. Amongst someother places I have seen the NRSV used is the Catholic and ecumenical 'International Bible Commentary' and some of the works of a former professor of mine, Fr richard Cassidy, in his work 'Four Times Peter'. I will see what else I can find, once I get a chance to look at my scripture books. could you tell me if there us any difference between the nrsv w apocrypha vs nrsv catholic edition? I know the nrsv w apocrypha has a few more books but are the deuterocanonical books the same translation? God bless. the translation is essentially the exact same. The only difference is in regards to Esther. The editions with the extended deuterocanonicals/apocrypha include the full Greek edition of Esther, along with the Hebrew version of Esther, which is shorter. If the NRSV didn't want to appear to be a liberal translation, then why in the world did the NCC allow it to be used as the base text for the horrible 'The New Testament and Psalms: An Inclusive Version' published by Oxford in 1995? Seems to me the NCC was saying, "Sorry the translators were too conservative. Here's what we were really hoping the NRSV would be". Will it ever be possible to get a NRSV that has the changes to the lectionary approved for Canada by the Canadian bishops and the Holy See? I would feel more comfortable about using such a version of NRSV. Ditto for any new version of NRSV that the ICPEL commission comes up with. Are you Catholic and over the age of 18? Have you said the Rosary Prayer at least once in the past year? If so, please take part in an anonymous research study online that examines the place of the Rosary Prayer in Catholic individuals’ lives. To participate in this doctoral research study, click the following link: https://www.surveymonkey.com/s/rosaryprayer Participation is anonymous and free of charge.